Of the 13 recessions that the American public has endured since the Great Depression of 1929-33, none has presented a more punishing combination of length, breadth and depth than this one. A new Pew Research survey finds that 30 months after it began, the Great Recession has led to a downsizing of Americans’ expectations about their retirements and their children’s future; a new frugality in their spending and borrowing habits; and a concern that it could take several years, at a minimum, for their house values and family finances to recover. The survey also finds that more than half of the adults in U.S. labor force (55%) have experienced some work-related hardship — be it a spell of unemployment, a cut in pay, a reduction in hours or an involuntary move to part-time work. In addition, the bursting of the pre-recession housing and stock market bubbles has shrunk the wealth of the average American household by an estimated 20%, the deepest such decline in the post-World War II era, according to government data. While nearly all Americans have been hurt in one way or another, some groups have suffered more than others. Blacks and Hispanics have borne a disproportionate share of both the job losses and the housing foreclosures. Young adults have taken the biggest losses on the job front. Middle-aged adults have gotten the worst of the downturn in house values, household finances and retirement accounts. Men have lost many more jobs than women. And across most indicators, those with a high school diploma or less education have been hit harder than those with a college degree or more. Whether by choice or necessity, many Americans have already significantly scaled back their pre-recession borrow-and-spend habits. According to government data, household spending has gone down, savings rates have gone up, consumer credit has remained stable and mortgage debt has plunged during this recession. The survey finds that the public is starting to see some light at the end of the tunnel. More than six-in-ten survey respondents (62%) say they expect their personal financial situation to improve in the coming year—the most optimistic reading on this question since before the recession began. Likewise, about six-in-ten (61%) say they believe the damage the recession has inflicted on the U.S. economy will prove to be temporary rather than permanent. This report sets out to present a comprehensive balance sheet on the Great Recession by looking at economic outcomes, behavioral changes and attitudinal trends among the full population as well as various subgroups. Our analysis is drawn from two sources—a comprehensive Pew Research telephone survey of a representative, national sample of 2,967 adults conducted from May 11 to May 31, 2010 (see Appendix for details), and a Pew Research analysis of government economic and demographic trend data. One striking finding of the survey is that some of the demographic groups that have suffered the worst economic hits are also the ones most optimistic about a recovery—both for themselves personally and for the U.S. economy as a whole. 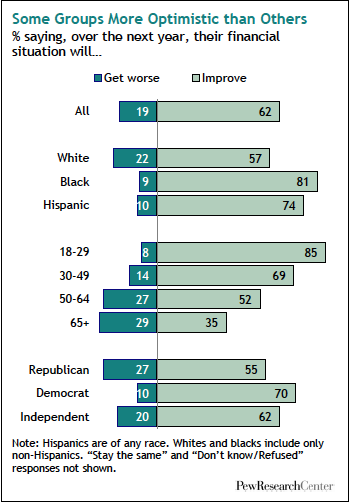 Blacks and Hispanics are more upbeat than whites. The young are more optimistic than middle-aged and older Americans. And Democrats are more upbeat than Republicans, even though Democrats have lower incomes and less wealth and have suffered more recession-related job losses. These group differences are apparent not just in responses to specific survey questions, but also in a set of statistical models that examine the independent impact of race, partisanship and age on the likelihood that a respondent will express optimism on six different attitudes about the economy tested in the survey, controlling for a range of demographic variables and recession-related experiences. 1 The analysis finds that blacks, Democrats and, on most questions, younger adults are more likely than whites, Republicans and older adults to hold positive views about the national economy and their personal finances, regardless of their income, education, gender or whether they have had difficulty paying their bills, making mortgage or rent payments; getting or paying for medical care; or have had to cut spending during the recession. One likely explanation for these seemingly counterintuitive patterns is that in an age of highly polarized politics, Democrats and Republicans differ not only in their values, attitudes and policy positions, but, increasingly, in their basic perceptions of reality. 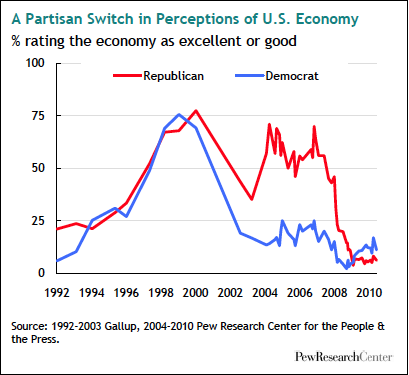 For example, since Obama was elected Democrats have become more optimistic than Republicans about the state of the national economy. For most of the time that George W. Bush was in office, the reverse was true: Republicans were more upbeat—often, much more upbeat—than Democrats. Are you in the American middle class?